This article is based largely on a lecture given by Dr. Donald Layman, PhD – Professor Emeritus from the University of Illinois (Nutrition Forum, June 23, 2013, Vancouver, British Columbia, Canada). People understand it’s important for children to eat enough protein because they’re growing but adults and older adults need to eat enough protein each day, as well. After youth have finished growing, they are at their maximum physical capacity between age 20 and 30 years old and after the age of 30 years old, adults begin to lose muscle mass at the rate of 1% per year . We’ve come to expect that as people age, they will gain more fat, loose bone mass and that they’ll have decreased muscle strength and that in time, these will lead to difficulty getting around, a greater risk of falls and eventually to physical disability. We commonly see older people with spindly legs and bony arms and we think of this as ‘normal’, but as discussed in a recent “A Dietitian’s Journey” article, we’ve mixed up what is “common” with what is “normal”. When we look at seniors in Okinawa, Japan for example, we don’t see this. They continue to do manual jobs and practice martial arts well into their 80’s and 90’s. Aborigine elders in Australia also remain lean, fit and active as seniors. This is normal. The physical deterioration that we associate with aging including weak bones (osteoporosis) and the loss of skeleton muscle mass (sarcopenia) don’t develop suddenly, but take place over an extended period of time – brought on by less than optimal practices in early middle age. The Recommended Dietary Allowance (RDA) for protein is set at 0.8 g protein/kg per day and describes the minimum quantity of protein that needs to be eaten each day to prevent deficiency. Protein researchers propose that while sufficient to prevent deficiency, this amount is insufficient to promote optimal health as people age. There have been several recent “position statements” issued by those that work with an aging population indicating that protein intake between 1.0 and 1.5 g protein / kg per day may provide optimal health benefits during aging [3, 4]. This seems at odds with the 2010 Dietary Guidelines Advisory Committee report  which states that ‘protein intake in the US is more than adequate’ and that ‘inadequate protein intake is rare’ . These seemingly contradictory positions are largely due to a difference in terms of how protein adequacy is determined. The RDA – more specifically the Estimated Average Requirement (EAR) is the minimum amount of protein intake required to prevent deficiency and is based on nitrogen balance studies (since nitrogen is the main component of the amino acids which make up proteins). The EAR is set at the amount of protein that allows the body to achieve nitrogen balance (protein making and protein breakdown is equal) and evaluates overall protein intake. Evaluation of optimal protein intake not only considers total amount of protein eaten, but also evaluates the metabolic roles of individual amino acids. While the EAR may be enough protein for healthy younger adults, higher intakes of specific Essential Amino Acids (ones the body can’t make, e.g. Leucine and Isoleucine and Valine) have been reported to improve body composition (muscle mass and increased strength) in older adults. 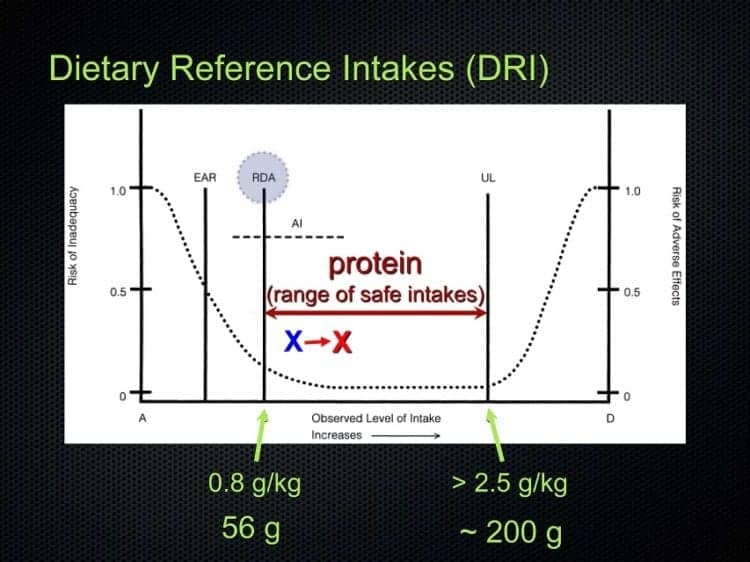 Another factor is that nitrogen balance studies look at the total amount of protein eaten in a day but don’t look at the amount of protein eaten at each meal [6,7] nor the role of the Essential Amino Acid Leucine which is required to be present for protein synthesis to begin (including synthesis of new protein for muscle and bone). Leucine is an indispensable amino acid in the making of all types of protein, but has a unique role in signaling the beginning of muscle protein synthesis. Much research has been done with large doses of free leucine, however a 2012 animal study found that in small meals with limited protein intake (often the case for older adults), that there was a specific minimum amount of Leucine required to be be present, before protein synthesis took place. This “Leucine threshold” had to be met or exceeded before the body would even begin the energy-expensive process of making new proteins! Typically, the average American eats only 10 g protein for breakfast, 15 g protein for lunch and has most of their daily protein at supper (65 g protein at supper) and since the minimum amount of Leucine that needs to be present in a meal (i.e. “Leucine Threshold”) is not enough at breakfast and lunch with this pattern of protein intake, protein synthesis is only triggered after the evening meal. As elaborated on below, it is recommended that this change. A 2013 study of muscle protein synthesis in adults in their late 30’s found that when the amount of protein is distributed evenly throughout the day (30 g protein at breakfast, lunch and supper) that significantly more muscle protein was made. Of importance, the (a) making of new protein and (b) the threshold at which protein will be triggered to be made differ with age – with older people needing a higher intake of protein and specifically the amino acid Leucine, than younger adults . This reduced muscle protein synthesis has been called “anabolic resistance” (anabolic means to ‘build’) and studies have shown that this “anabolic resistance” can be overcome with meals containing higher amounts of Essential Amino Acids and appears to be related to the Leucine content of the meal . These findings led to Dietary Recommendations for older adults that emphasize a minimum of 20 g of protein per meal containing more than 2.3 g Leucine to optimize the building of new muscle protein . It is not only growing children and youth that need to eat adequate protein daily, but older adults as well. In many Indigenous cultures, the Elders eat first and eat the best of the animal proteins – which may factor in to the preservation of bone and muscle mass we see in many of these cultures. The average protein intake for men >20 years old in the US is ~98 g per day and for women it is 68 g per day which may be adequate in total for healthy young adults, but is considered imbalanced in terms of distribution, as a minimum amount of Leucine is required for protein synthesis (specific amount in humans has not yet be determined). Dr. Layton recommends that until further research is conducted and the optimal amount of Leucine is determined that young adults and middle aged adults distribute their protein evening throughout the day with ~25 g (women) -30 g (men) of animal-based protein at each meal. The reason high biological value proteins from animal sources (meal, poultry, fish, egg, dairy) are recommended is because these are high in Leucine (rather than having only 10 g protein for breakfast, 15 g protein for lunch and 65 g protein at supper). The recommendations above for older adults to eat 1.0 – 1.5 g protein / kg per day distributed evening over three meals which would be on average ~30-40g of animal-based protein at each meal to provide for optimal muscle protein synthesis, preventing sarcopenia – the muscle loss we’ve come to see as ‘normal’ in aging. According to Dr. Layton, the Upper Limit of Protein according to the Recommended Daily Allowance for Protein is set at ~ 2.5 g protein / kg per day which would put the maximum amount for most adult men at ~200 g protein per day. Need help determining how much protein you should optimally be eating at each meal and from what sources? Please send me a note using the “Contact Me” form and I will reply as soon as possible. U.S. Department of Agriculture and U.S. Department of Health and Human Services, Dietary Guidelines for Americans, 2010. 7th Edition, Washington, DC. Mamerow MM, Mettler JA, English KL, et al. Dietary Protein Distribution Positively Influences 24-h Muscle Protein Synthesis in Healthy Adults. The Journal of Nutrition. 2014;144(6):876-880.